Using the Cordova CLI you can create and manage your Cordova applications. You can also achieve the same in the Eclipse IDE by using the THyM plug-in. 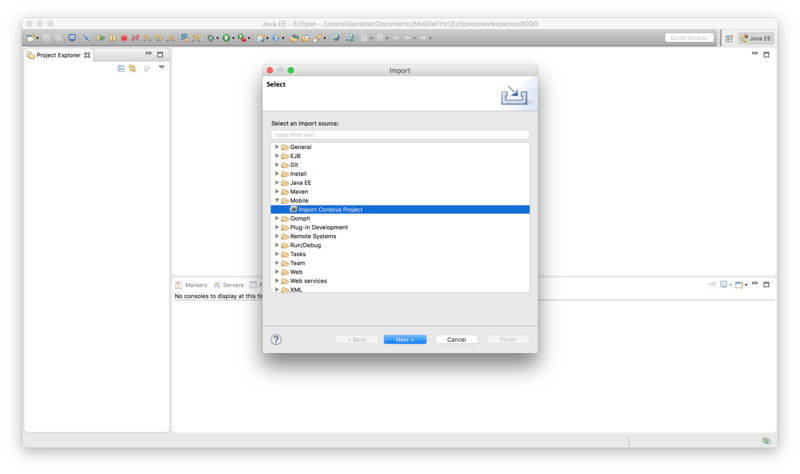 THyM provides support for importing and managing Cordova projects in Eclipse. You can create new Cordova projects, as well as import existing Cordova projects. You can also install Cordova plug-ins into your project through this plug-in. Learn more about THyM in its official website. 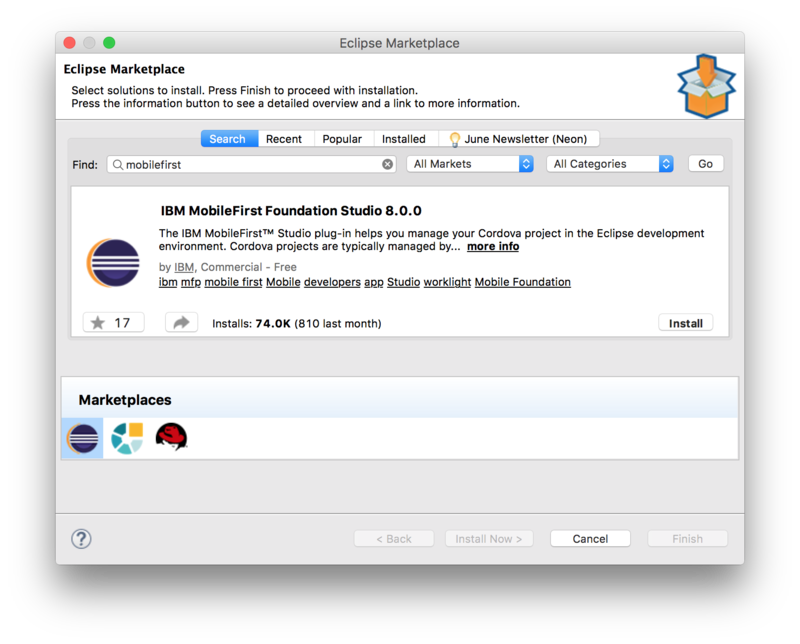 The MobileFirst Studio plug-in for Eclipse exposes the various MobileFirst commands in the Eclipse IDE. Specifically, it provides the following commands: Open Server Console, Preview App, Register App, Encrypt App, Pull App, Push App, Update App. 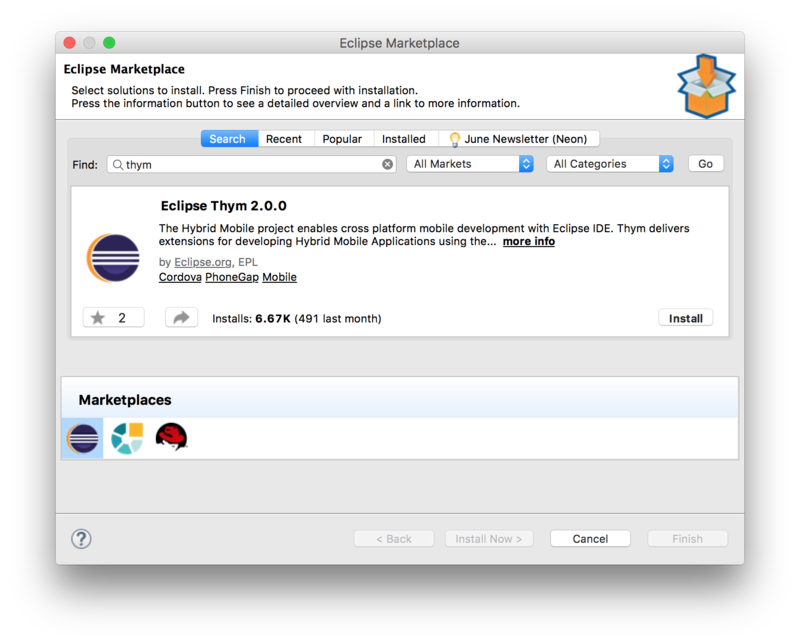 This tutorial walks you through installing the THyM and MobileFirst Eclipse plug-ins. Restart Eclipse for the installation to take affect. In this section we will discuss how to create a new Cordova project using THyM. In this section we will discuss how to import an existing Cordova project that has already been created using the Cordova CLI. Click Browse… and select the root directory of the existing Cordova project. If you import a project without any platforms you will see the following error, please see the adding platforms section on how to resolve this error. Once you have installed THyM and the MobileFirst CLI plugin into Eclipse and have either created a Cordova project or imported a Cordova project you can then follow the below steps to install the MobileFirst SDK via Cordova plugin. To access Mobile Foundation shortcuts, right-click the root project directory and navigate to IBM MobileFirst Foundation. Preview App Opens the app in the browser preview mode. Opens the app in the browser preview mode. 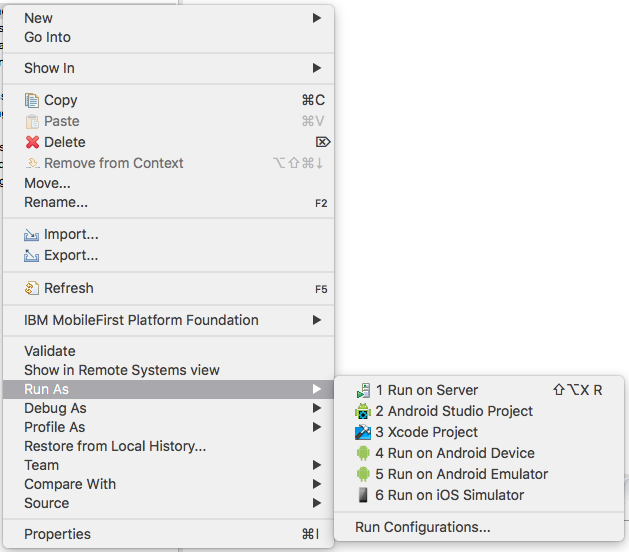 If you would like to test or deploy to a device via an External IDE (Android Studio or Xcode) this can be accomplished via the the context menu. Note: Please be sure to manually import your project into Android Studio to set up the gradle configuration before launching from Eclipse. Otherwise you might run into unnecessary steps or errors. 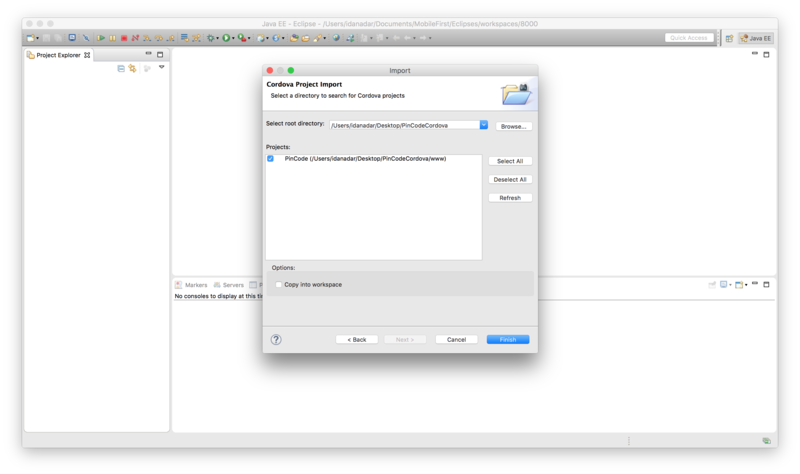 From Android Studio select import Import project (Eclipse ADT Gradle, etc.) and navigate to your project and select the android directory within the platforms directory. In the Eclipse project explorer right click the desired platform (i.e. android or ios in the platforms directory) → hover over Run As in the context menu → select the appropriate external IDE. Adding additional platforms is a simple process that the THyM plugin does not make intuitive. You have two options to accomplish the same task, and they are as follows. Right click your project and select properties from the context menu. In the presented dialog select Hybrid Mobile Engine from the left hand menu. In this pane you will be able to select or download the desired platforms. Right click your project and hover over Show In and select Terminal from the context menu. cordova platform add <platform> where ** equals your desired platform, will add the specified platform to the project. For more information on Cordova platform specific commands see Cordova platform command documentation. Select MobileFirst Studio Plugins to show the plug-ins preferences page. While previewing an application live update is available. You can make updates and save you changes and watch them auto refresh in the preview. 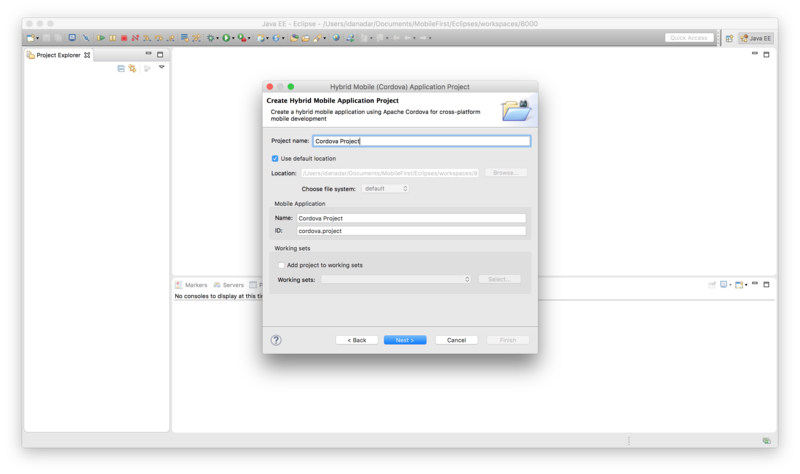 Using the MobileFirst Developer Kit, You can couple together the above with running the MobileFirst Server in Eclipse to create a more integrated development environment.